It’s been a full 11 years since Joaquin Phoenix and M. Night Shyamalan last collaborated for The Village, a somewhat divisive thriller that failed to match the box office heights of Signs, which drew in over $400 million worldwide in 2002. Nevertheless, fast forward to the here and now and Deadline reports that the pair are close to reuniting for a brand new project. According to the outlet, Phoenix has entered negotiations to topline the as-yet-untitled film. Granted, his would-be collaboration with Shyamalan isn’t the only potential reunion on the cards, as the director’s latest is to be produced by Jason Blum’s Blumhouse Pictures banner. Over the past few months, Shyamalan has worked in tandem with the horror maestro for his upcoming genre piece The Visit, itself described as a twisted, modernized take on the famed tale of Hansel and Gretel. Little-to-no information has been released about the filmmaker’s new venture – this is Shyamalan we’re talking about, after all – however, Deadline notes that the allotted budget is more in line with The Visit‘s $5 million as opposed to some of the director’s more big-budget affairs in the vein of The Last Airbender. As for Blumhouse Pictures, the studio may now suffer a hit in the short-term with the underwhelming Sinister 2, though Paranormal Activity: The Ghost Dimension and Eli Roth’s The Green Inferno will hope to fly the flag for the company’s signature low budget/high box office feat. 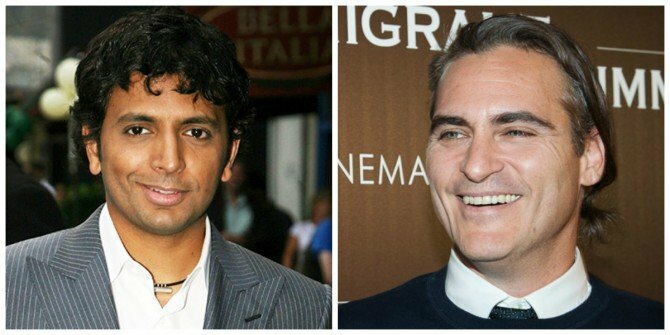 Should Joaquin Phoenix sign along the dotted line for M. Night Shyamalan’s new feature, the production will begin filming in Philadelphia before the year’s end.